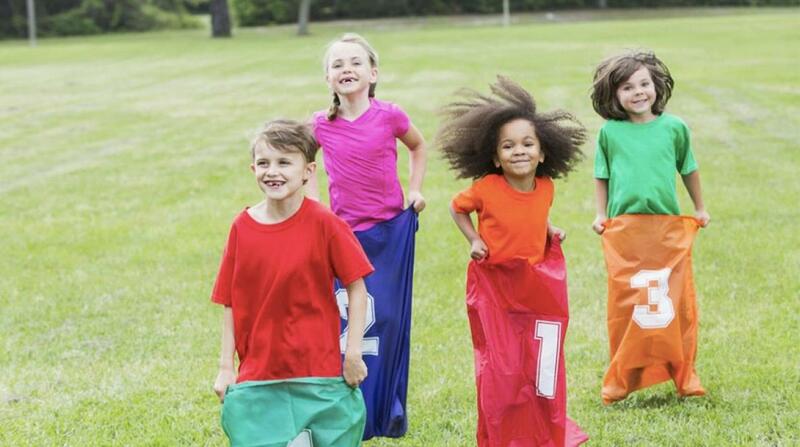 Hop your way to victory in an old-fashioned sack race! In the past, this game was played using large, burlap potato sacks. Since those aren’t easily obtainable anymore, good quality burlap bags can be purchased from coffee roasting companies. You could even use King-Sized pillow cases (if you don’t mind them getting grass-stained! ), or buy them online. This race is more about cooperation than speed. Divide party guests into pairs and have them stand side by side. Then, tie each couple’s inside legs together with a bandana. Duct tape also works well in place of a bandana if all participants are wearing jeans. To play, the three-legged pairs must race to the finish line. Have two adults stretch a length of crepe paper across the finish line, and let the winning team break through the paper. Historically, the Limbo was danced as a part of wakes and funerals in the Caribbean Islands. More of a dance than a game, modern-day Limbo is a celebration. To play, line the kids up single-file. Two adults stand on either side of the limbo pole or stick and hold it up horizontally in front of the line. If you don’t have a pole, use a pool noodle or broom. Start the music — any music with a strong island beat will do. The object of the game is to pass under the stick by bending backward, without touching the stick or falling. The two adults start with the stick held high enough for the kids to walk underneath, and then lower the stick a bit each time the first person in line comes around again. Keep going until the stick is too low for anyone to pass underneath without touching it. This traditional Chinese game is best played with a large group. To play, arrange kids in a single-file line and instruct each to hold onto the waist of the person in front of them. Tuck a bandana into the pocket of the last one in the line. The “head of the dragon” (head of the line) leads the line in chasing the “tail” (the last in line) as they try to grab the bandana without anyone letting go of the person in front of them. The middle of the line tries to keep the head from catching the tail, resulting in lots of tangled-up fun! Once the bandana is captured from the tail, the tail becomes the head and they play again. Before the party, blow up balloons, at least one per guest, plus a few extras. Cut string into 16-inch lengths and tie one end of each to a balloon. Curling ribbon or yarn works well. To play, tie a balloon to one ankle of each child. Then, tell the kids run around trying to “stomp” or break everyone else’s balloon while keeping their own from getting popped. The last guest with a full balloon wins! This fun game is often played at Easter events, but it makes a great birthday party game, too! Before the party, put aside large spoons and eggs. You can use hard-boiled eggs, plastic Easter eggs or even purchase a wooden-egg-and-spoon game kit. Whatever type of egg you choose, for small groups plan on one egg and one spoon per kid, and for larger groups, have one set per team. Either way, be sure to have a few extra eggs on hand! To play, line up party guests side-by-side and give each a spoon and egg. The object of the game is to cross the finish line while balancing the egg on a spoon, without dropping the egg. It’s harder than it sounds! If you have a large number of players, play this game as a relay race. Divide the group into teams, each team member must race while balancing the egg on the spoon to a certain point, then turn around and go back to the start. Mark the turning point with a traffic cone or other object. They then must pass the egg to the next member who does the same. First team to finish without dropping the egg wins!